Twenty years ago, when voters first approved Sound Move, the idea of rapid rail transit in Seattle was only a fuzzy concept. It was something that had been declined by 1960s voters and only the oldest residents might have recalled the city once had a sprawling network of streetcars. But finally, in 2009, the central portion of Link light rail opened between Downtown and the airport and opened up a new realm of transportation. Seattle’s transit world grew again with the next two stations that opened Saturday. Sound Transit’s purpose is to provide mass transit connections between the central Puget Sound’s urban centers. It originated out of the 1996 Sound Move ballot measure approved by voters in the urbanized areas of King, Pierce, and Snohomish counties. The measure was a $3.9 billion transit package, including $1.7 billion for a 25 mile light rail system, that also funded intercity express bus lines, the Sounder commuter rail service between Everett and Lakewood, and the Tacoma streetcar. The measure also funded infrastructure like HOV lanes, transit centers, and park-and-rides. 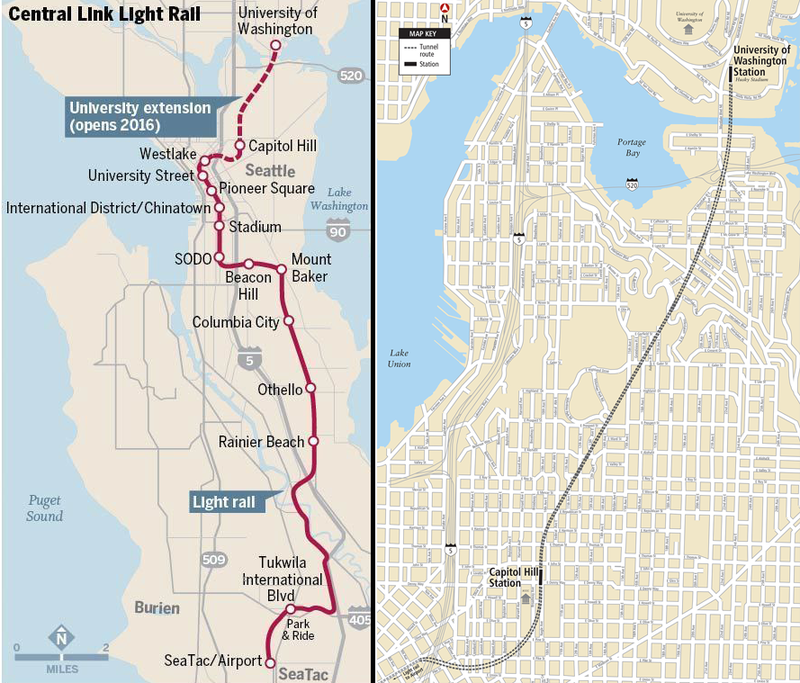 As part of this package Central Link was originally supposed to reach the University District. However, in the late 1990s Sound Transit’s ambitions exceeded its fiscal realities and federal grants dried up. The agency came under fire for its poor planning and financial mismanagement. New leadership in the early 2000s achieved a clean audit and the agency was awarded federal funding for Central Link, but by then the line couldn’t be extended to its original terminus and ended in central Downtown Seattle. A stop in First Hill was also cut, resulting in Sound Transit funding the First Hill streetcar to connect that neighborhood with other light rail stops. By the end of 2009 the 15 mile Central line was operating between SeaTac airport and Westlake Station. Stops in-between include Tukwila, the Rainer Valley in southern Seattle, Beacon Hill, Sodo, and three other stops in the core of Downtown. Average weekday passenger counts have increased year over year, peaking above 40,000 last year. University Link is a northward 3.15 mile underground extension of the original line using twin-bored tunnels. At their deepest point beneath Volunteer Park the tunnels are 300 feet below ground. Sound Transit says the $1.9 billion project was completed six months ahead of schedule, $200 million under budget, and without any major construction injuries. The addition of the two stations is expected to add 71,000 average weekday riders to the system by 2030. The University Link extension nearly fulfills the original vision to reach the U-District. The neighborhood hosts 45,000 students at the University of Washington’s main Seattle campus. Link’s new northern terminus, UW Station, is on the southernmost edge of the campus next to Husky Stadium and the monolithic UW Medical Center. As part of the next project, called Northgate Link, an actual U-District station at the corner of Brooklyn Avenue and NE 43rd Street is currently under construction and planned for opening in 2021, along with stations in the Roosevelt neighborhood at NE 65th Street and at the Northgate Mall at NE 103rd Street. UW Station is poorly located. Husky Stadium hosts only six home football games per year, and the station itself is surrounded by a massive asphalt parking lot and six lanes of pedestrian-hostile Montlake Boulevard. The station is essentially a compromise between a location in the heart of the campus proper, which short-sighted university officials opposed, and the Montlake Freeway Station at SR-520 that provides access to Eastside job centers like Redmond, Bellevue, and Kirkland. Instead, both students and Eastside bus riders who want to transfer have a minimum ten minute walk to and from the station’s awkward location. There are also zero commercial services within sight of the station, not so much as a coffee stand, and there is no chance for transit-oriented development like apartments or even student housing. That said, Sound Transit made the best of the situation by building a generous pedestrian and bicycle bridge over Montlake Boulevard and a land bridge across NE Pacific Place, allowing people to reach the station from campus without crossing roadways. There are also new connections to the regional Burke-Gilman Trail, a popular bicycle commuting route that stretches westward to Ballard and northward to neighborhoods along the shores of Lake Washington. A new plaza, furniture, lighting, wayfinding signs, bicycle parking, and an abundance of trees help improve the otherwise desolate locale. The station will also be convenient for the 4,300 employees at the UW Medical Center, and certainly it is still close enough to the UW campus to spark a paradigm shift in how U-District workers and residents will get around. Sound Transit projects the station will see 25,000 daily passengers by 2030. Part of that shift will also come with significant changes in King County Metro’s bus network. Next Saturday, March 26, northeastern Seattle will see new and consolidated routes with higher frequency than ever before. Much of the changes are designed to deliver far-flung riders to UW Station to provide a more reliable trip to Downtown and beyond, whereas before the workhorse routes 71/72/73 alternated between the Interstate 5 express lanes and slogging through surface street traffic. 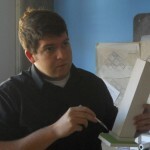 I was part of the Sounding Board that oversaw the restructure and made a series of posts on the process. The bus network isn’t changing nearly as much in central Seattle, but Capitol Hill Station promises to make an even bigger change in lifestyles and commutes. The station is smack in the middle of Seattle’s most densely populated neighborhood (nearly 50 people per acre) and surrounded by bars, restaurants, shops, parks, and other attractions of all types. As such, the neighborhood is highly walkable and has existing bus service to and from the station. The First Hill streetcar’s northernmost stop is also directly outside one of the station entries. The streetcar connects to several hospitals and Seattle University, which enrolls 7,000 students, and the station itself is within a stone’s throw of Seattle Central College’s 16,000 students. Sound Transit projects daily ridership of 14,000 passengers by 2030. Two of the station entries currently stand amid bare pavement on a 2.6 acre site. Sound Transit has partnered with a developer to construct a mixed-use development on top of the station, with construction slated to begin this year. Up to five six-story buildings will contain retail space and 418 apartments; 38 percent of the apartments will be required to rent below market rates for 12 years, and 20 percent will be permanently rent below market rates. A third of the units will have at least two bedrooms. The site will also have a daycare and a new plaza space for the Capitol Hill Farmer’s Market and other community events. A post on Capitol Hill Seattle Blog documented the mix of buildings which used to stand on the site, none of which were taller than three stories. Among about a thousand other people I was lucky enough to win a “golden ticket” for the first public ride between the two new stations. The ceremonies began with an activation of UW Station, shown in all its glory in the video below. I also had a chance to revel in the beauty of these two stations. The architecture is actually fairly bare and simple with a lot of large metal panels and sheets of glass, but this is balanced by colorful wall tiles and large scale art installations. Suspended above the Capitol Hill Station platform are two sliced up A-4 fighter jets wrapped in pink plastic and, placed nose-to-nose, appear to kiss. The UW Station’s prominent piece is an etched metal box that encloses the upper mezzanine with blue symbols of the geological layers encountered during the station’s excavation. And the excavation was significant. Because the tunnel has to dive underneath the nearby Montlake Cut waterway, UW Station has three sets of escalators for descending to 120 feet beneath the surface. Capitol Hill Station’s platform is a mere 65 feet below ground and has two escalator sequences at each of its three entries. Sound Transit is advertising the time between stations as four minutes. That seemed accurate for one trip from UW to Capitol Hill, clocked at 4.5 minutes, but it overestimated another trip from Westlake to Capitol Hill Station at 2.5 minutes. Regardless, that’s faster than any other mode transportation by far. Google Maps estimates traveling by other modes as: 25 minutes by foot; 16 minutes by bike; 15 minutes by bus; and eight minutes by car. The advertised times likely give wiggle room for busy times and to deal with buses in the Downtown tunnel. Still, the rapid trip is going to make the University District and Capitol Hill incredibly more accessible to all kinds of people for all types of trips. The estimated travel time from UW Station to SeaTac airport is 46 minutes. One thing immediately noticeable at both stations was the lack of trash bins, seating, and restrooms. These are important for keeping stations clean and comfortable for passengers. With the exception of SeaTac/Aiport Station, public restrooms aren’t present at other Link stations but they are particularly important for remote areas like UW Station. They would obviously require resources for upkeep, but their exclusion is a missed opportunity that must be considered for future stations. Trash receptacles can be easily implemented and multiplied without major hassle. And more seating along the length of the platforms is going to be needed for weary travelers, kids, and the elderly, even if trains are expected to arrive frequently. The cutoff for service, however, is problematic. The last train on weekdays and Saturday nights will leave from UW Station at 12:30am, and the last train on Sundays leaves at 11:50pm. This is not enough to enable safe travel for weekend night life nor to enable late night airport connections or help service workers get home from graveyard shifts. Hours also need to be extended early in the morning. Another potential issue is lack of space for objects like bicycles, strollers, wheelchairs, and luggage. On the opening day Sound Transit was running three-car trains for the crowds, but even so there was little maneuvering room for the large objects that are essential for multi-modal connections and for families to get around. Seattle Neighborhood Greenways and Seattle Bike Blog have called for more room for cargo bikes and other bulky items that people to take with them on a truly versatile transit system. The dynamic signs above the platforms are a great amenity but could still be improved. The signs display the estimated arrivals of the next three trains, but that text and the current time is displayed much smaller than the name of the destination. The destination names also need to be accommodated with directions (e.g. north and south) to help new riders know which direction they are traveling. Further, it is disappointing that the Downtown tunnel’s four stops still do not have the same kind of real-time arrival information. It is a standard for any kind of reliable transit system and astounding that they were not implemented given University Link’s huge budget and $200 million in cost savings. Despite the minor drawbacks, the two new stations are overall impressive and a very welcome addition to Seattle’s bustling core. The high quality of the materials and expansiveness of the station’s walkways, mezzanines, and platforms ensure these stations are durable for rush hour crowds and are built to last for the inevitable growth in ridership. One more station will open late this year: Angle Lake in SeaTac, 1.6 miles south of the airport. The $383 million project includes a 1,050 space garage and expects to generate 5,400 average daily weekday riders by 2018. Buildout of Northgate Link’s three stations, mentioned above, is on track for completion by 2021, though with Sound Transit’s record it might be earlier. Beyond that is the Lynwood Link project, the first light rail foray into Snohomish County, expected to open with at least four stations (with options for two more) by 2023. Also due for opening in 2023 are the ten stations of East Link, which will cross the I-90 floating bridge to serve Mercer Island, Bellevue, and west Redmond. These are all being funded by the $18 billion Sound Transit 2 measure approved by voters in 2008. The third chance for the region to expand the light rail system is rapidly approaching. Sound Transit 3, or ST3 for short, is tentatively planned to be up to a 25-year package for completing the north-south network to Everett and Tacoma. It will also likely include extensions from Downtown Seattle to both Ballard and West Seattle, and there are several options for lines on the Eastside connecting Downtown Redmond, Kirkland, and Issaquah. The package will go before voters on the November 2016 ballot. While the current projects are transformative in their own right, the projects proposed for ST3 will finally build out a complete high-capacity transit system that puts the Seattle region on par with the world’s major cities. University Link is a vital link to Seattle’s future. It will empower people, whether they be residents, employees, or visitors, to move about more freely, safely, and conveniently for at least the next 100 years. Light rail will work well with last year’s passage of Move Seattle to fund street maintenance and bicycle and pedestrian infrastructure, alongside continued improvement in local bus service. Seattle isn’t finished, and its transportation network must continue to expand and be refined to meet the needs of a growing city. TRU has a petition to run trains later on weekends. DC’s Metro runs until 3am Friday and Saturday. Love the article, but can’t believe you didn’t specifically mention the Ballard to U village portion of possible future rail. This piece is critical for North Seattle. Leo Saul Berk’s piece is called “Subterranium”, planetariums are mentioned in the blub at the station but aren’t the name. Thank you, I was looking for that! It will be corrected.